Live longer = work longer? 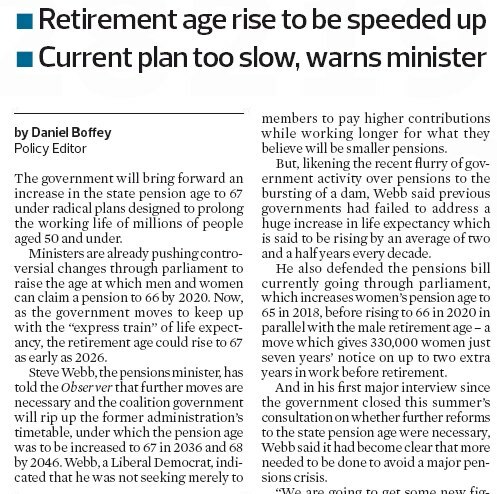 Sept 11, 2011 – Today’s Observer subhead says: “Retirement age rise to be speeded up”. It quotes the pensions minister: “Everybody knows we are living longer. It is like an express train […] we think now we have got to move on these things”. 1. We’re living longer, so we must work longer. 2. Express trains require immediate action! Let’s pause the action-movie DVD for a moment. The male pension age hasn’t changed for a century? Life expectancy has increased over that time? What does rising life expectancy indicate, if anything, about socio-economic conditions? How do “structural” weaknesses (to extend the “dam breaking” metaphor) lead to a gradual improvement in life expectancy? In a recent article for CNN, Douglas Rushkoff suggests there’s a “backwards logic” to the notion that we must build bridges, railways (etc) in order to “put people back to work”. The “live long & prosper slave away” logic seems not just backwards, but express-train-in-reverse-with-idiot-driver backwards. It is indeed silly. Just how does Steve Webb think we’ve afforded to pay for the costs of increased life expectancy for all these years? By creating jobs especially for old people (so there’s no competition with young unemployed)? They are so far removed from reality. It’s the same Steve Webb who pocketed £8,400 of taxpayer money (MP’s expenses) when he bought a London flat for £280,000 after selling one (just 100 yards away) for £195,000. (The £8,400 was his claim for stamp duty). “Mr Webb’s claims for mortgage interest payments jumped from £678 to £1,158 per month. He also claimed £665 for a mortgage arrangement fee and submitted bills of £575 and £325 for solicitors’ fees. “Shortly before selling the first flat, he had it cleaned at a cost of £277.47, which he claimed back from the Additional Costs Allowance. The claim included £1.27 on Harpic, £1.45 on 10 refuse sacks and 99p for two dusters. “The MP for Northavon, near Bristol, also claimed £141 for a hotel bill after the sale temporarily fell through. @Karen Mac: The pension, and much else over the last few decades were paid for through borrowing. Some State borrowing, some personal borrowing which then improved GDP and allowed greater State borrowing. It has recently been noticed by certain lenders that they had lent so much money that both the State and the individuals who comprise the State could not possibly repay the debt. Unfortunately a number of other countries and their lenders went through a similar “awakening” at the same time resulting in some temporary adjustments in global financial sentiment. It’s tough to get a loan these days, just ask the Greeks. Now of course there were also productivity improvements but these tend to appear as higher wages, which we spend on pointless trivia like DVD players, or as lower prices which are cool but simply encourage us to spend our higher wages. We could have chosen to invest our higher wages but those investments would mostly have been in banks and they really got killed lending money to people who don’t seem to be able to repay them. All of this means that government can’t spend as much as they used to. They could cut back on nurses pay but perhaps they get paid too little at the moment. They could cut the pension but that’s going to be tough on the elderly. Probably best to let those people who’d retire this year keep working for another year or two. A lot of people don’t hate their job and really quite like the routine. Certainly, if you were just itching to retire this year because it’s all you’ve been looking forward to for the last fifteen or twenty years then it’s bound to seem like quite a set-back. Still, you get to help others; the purpose of working in the first place, you make a bit more money; which might come in handy, and when you’re retired in another year or two the pension you get might just be enough to live on. If this is the worst thing that happens in the remainder of your life then you’ll probably be doing pretty well because spirit crushing loneliness from the death of your friends and spouse along with the diseases that routinely afflict the elderly, amongst other things, can often be less fun than you might imagine.